Moa White Lager. I’d not normally be keen on waxing lyrical on beer you buy by the dozen, but I’m honestly about 3 dozen into these and I’m going to share without a care. This is beer that is similarly priced to other lager types, you know the green bottle ones with German sounding names. These are 330ml bottles of a 4.7% ABV beer, that’ 1.2 standard drink in a serve size, and about 141 calories. 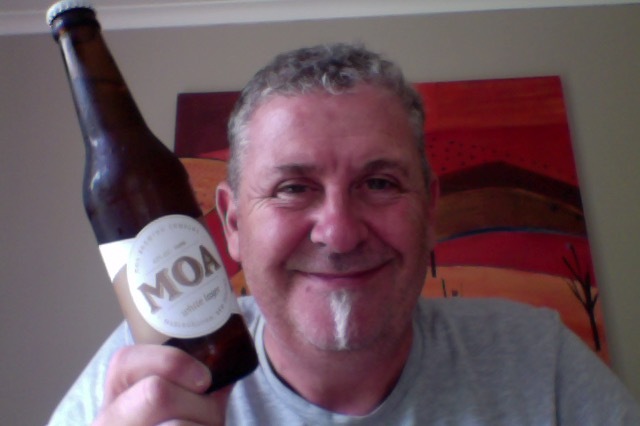 Moa White Lager is an easy drinking, silky smooth, crystal wheat beer with hints of spice. Brewed with a blend of premium wheat and pilsner malts, subtly hopped with the renowned Motueka hop, and bottle conditioned with a wine yeast, this beer shows an array of delicate tropical fruit and citrus characters. So, What could possibly go wrong? A New Style of beer for me ! Zest is the way to describe this on opening, fruity, light, sweet. Pours a clear light yellow with a small white foam of head, which fades to a film. Lovely and clear in the glass. Aroma is lovely, fruity sweet, if you’re pushing perhaps a little of that bubblegum. For me this is just my happy place for a lager style beer, I know it’s not a lager, but it’s a beer in that end of the spectrum and colours. This is less full and sugary than a Belgium beer, and not as hoppy bite as a pilsener. This offers up a lovely median point between a fuller wheat beers and the hefeweizens. Think of it as a filtered what beer perhaps, it is it’s own style and taste, and is very similar to the other two styles. Where did I get it? They’re in places where 12 packs are sold. Am I enjoying it? Yes, I’m in love with this beer. Would I share with a friend on a porch and set the world to rights? I’ve shared this beer with others who have brought it an enjoy it, it won’t be for everyone, and it’s probably a beer I’d take to a party or gathering where I get to enjoy a decent flavoured beer from a fancy brewer without raising eyebrows. 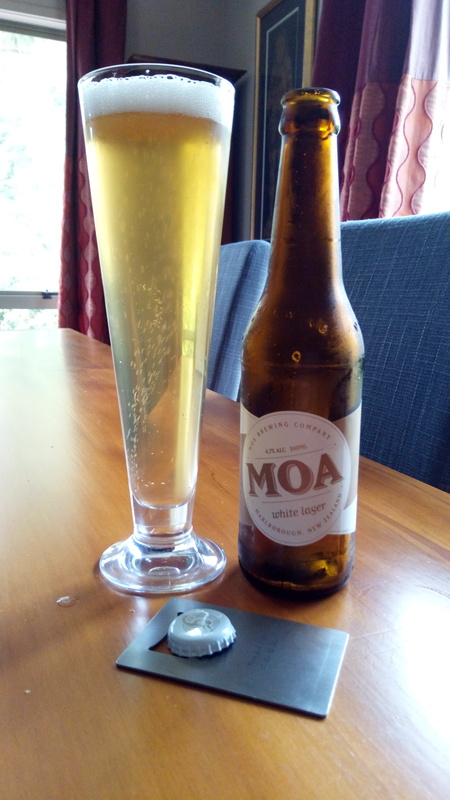 This entry was posted on February 25, 2017 by Philip Walter in Beer, Beer of New Zealand, Beer Review, Brewed By, Craft Beer, Critic, German Kristallweizen, Justsaying, Moa and tagged Beer, craft beer, German Kristalweizen, German Kristalweizens, Kristalweizen, Moa White Lager.